Cosmology and astrophysics nowadays is dominated by the need for the inclusion of Dark Matter at every scale, from galaxy size, to cluster size, to super-cluster size, to the size of the whole Universe. It is needed at every scale size to get the physics to agree with the observational data. After 50 years of looking in local laboratory experiments there has not been a single trace of it found anywhere. And it would not be overstating the case to say Dark Matter is in serious crisis! This situation reminds me of a current political trend in America, that is, “Black Lives Matter”, which has turned into a major movement. The proponents of it, describe it as a response to virulent anti-Black racism that they claim permeates the US society. With that in mind, and in response to a discussion on Dark Matter, a friend sent me this graphic (see Fig. 1), quite obviously as a joke. It is funny but on another level it highlights a problem in the cosmology/ astrophysics society that is not so funny. The problem is that the majority are saying “Dark Matter Lives”. And they are saying that despite the actual experimental evidence to the contrary. In their minds it only “lives” because without it the standard paradigm is “dead”. Big bang cosmology and the dynamics of galaxies and clusters of galaxies require that “Dark Matter Lives”. 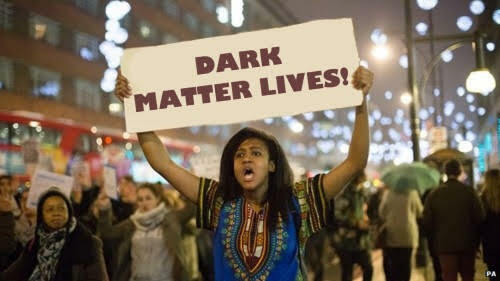 Those who voice the obvious fact that Dark Matter is not real, or, should I say, is “dead”, are sidelined or ridiculed. The secular physics community hold that those who express such opinions are expressing a sort of anti-science bias because it ultimately involves a rejection of the big bang paradigm.